Last week, we showed you the first cast photo from the set of Suicide Squad, with every main cast member assembled except for Jared Leto. Today, director David Ayer sent out a new photo commemorating the first day of principal photography on the Toronto set, showcasing the first slate used in the production. 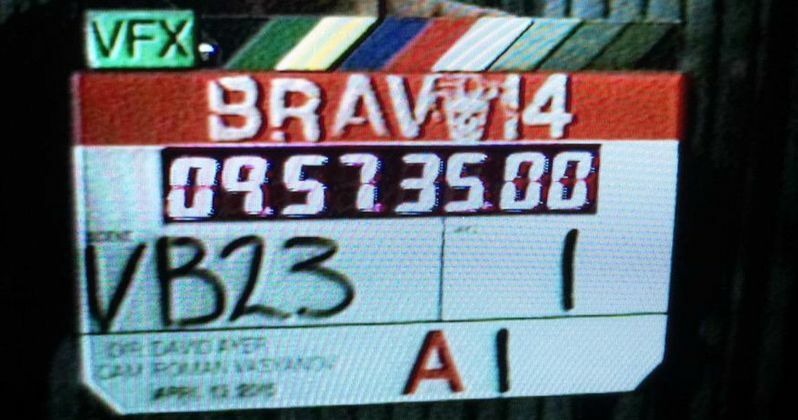 You may notice that the slate uses the working title "Bravo 14," so if you find yourself in Toronto and see signs for "Bravo 14," it's actually for Suicide Squad. Jay Hernandez, Scott Eastwood, Ray Olubowale are also co-starring in the superhero adventure, but their roles have not been confirmed at this time. Warner Bros. has already issued an August 5, 2016 release date, but it isn't known how long of a shoot David Ayer and his cast are in for. Stay tuned for more on Suicide Squad as production continues in Toronto.